SCARBOROUGH, ENGLAND (June 10, 2015) — We certainly can’t complain about the weather for our fieldwork in Yorkshire this year. Today was spectacular with blue skies and cool sea breezes. 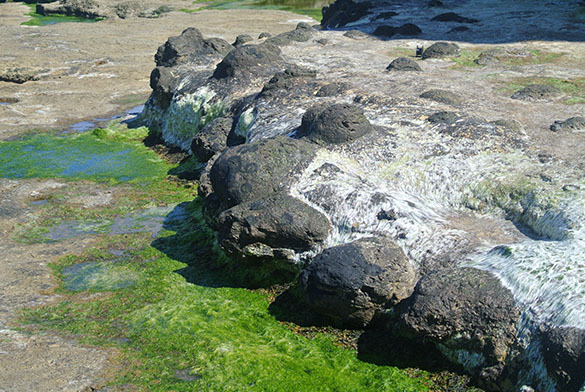 It made the long beach hikes very pleasant. This was our first day without our English colleague (and Yorkshire native) Paul Taylor, so we were on our own for transportation. 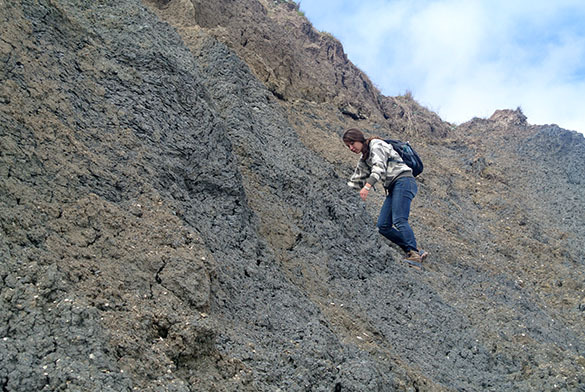 We figured out the bus system, though, and made it to the Lower Cretaceous Speeton Clay at Reighton Sands in good time. 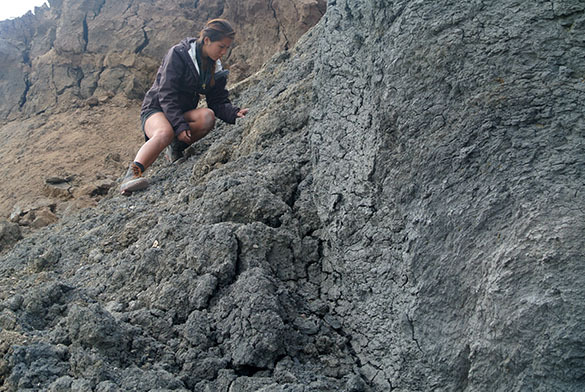 Here is the last view you’ll have of Mae Kemsley (’16) working on her outcrops of this gray, mushy unit. We collected sediment samples this morning, along with a few last fossils. Here is Meredith Mann (’16) doing the same. 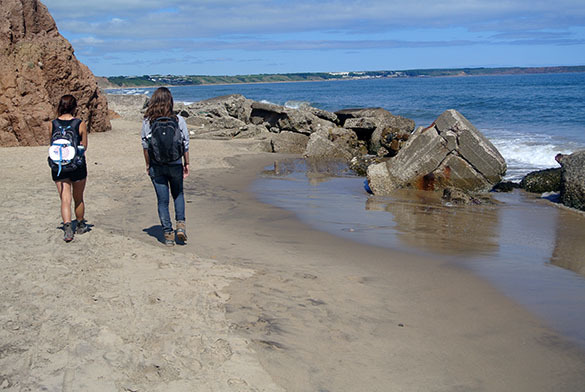 We finished all of our fieldwork for Mae’s project by 10:30 a.m., so we could make a long beach hike from the Speeton Cliffs northwards to Filey. 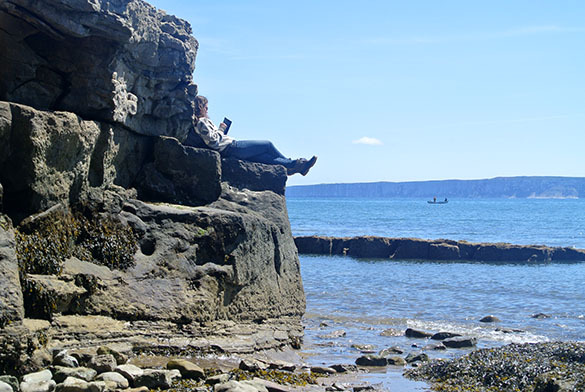 We hiked as far as we could on Filey Brigg, but had to chill because our sites were still cut off by the high tide. 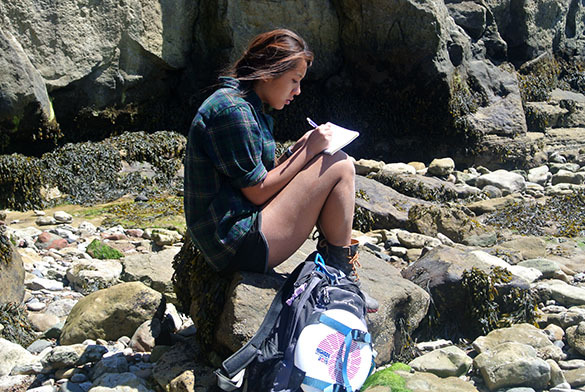 Waiting for a tide to drop is tedious, but the students had plenty of patience. We reached the large slabs of Hambleton Oolite Member (Upper Jurassic, Oxfordian) with Thalassinoides burrows to begin Meredith’s data collection. 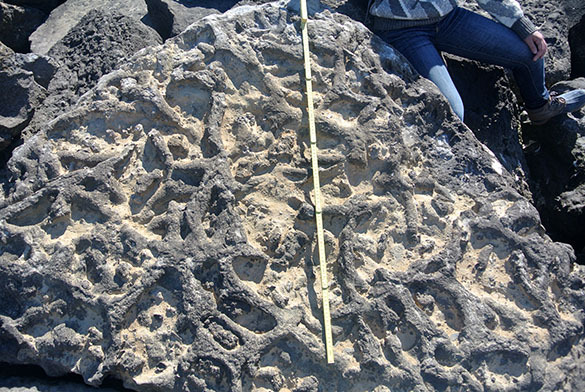 These are impressive trace fossils, with numerous shelly fossils in the surrounding matrix. We took reference photos and collected what we could. Unfortunately only three slabs met our criteria for measurements, so we moved to a unit exposed just below the Hambleton. 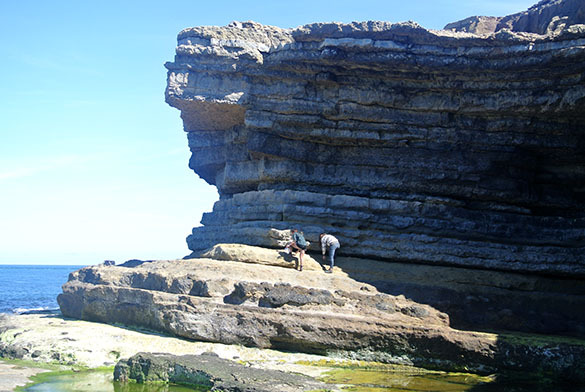 On the north side of Filey Brigg there are these large “cannonball” concretions, which were excellent stratigraphic markers for us. They are in the Saintoft Member of the Lower Calcareous Grit Formation. They told us that the units above were the Passage Beds Member of the Coralline Oolite Formation. Mae and Meredith are here collected fossils from the Passage Beds above the concretions. This unit is interesting to us because it contains shelly debris that was apparently washed onto shore during storms. These shells are often heavily encrusted with oysters and serpulids. Such sclerobionts have been little studied in this part of the section. 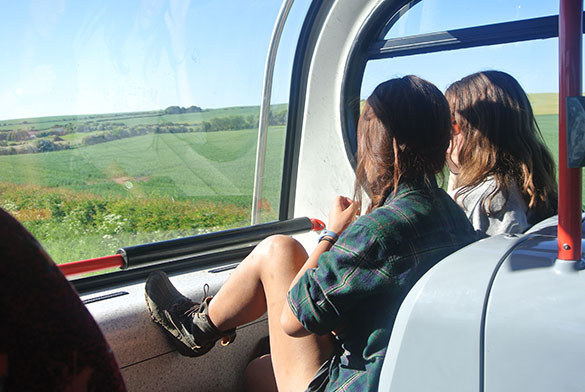 On our sunny ride home the students sat in the front of the top section of our double-decker bus. Not a bad commute for a day’s work!